Regain your independence to do that everyday activity that has become a challenge. Ideal for anyone who has limited mobility of their body due to surgery, an injury or a debilitating condition, the BodyHealt Extra Long Handled Shoe Horn provides the assistance needed to promote your independence and make you feel whole again. 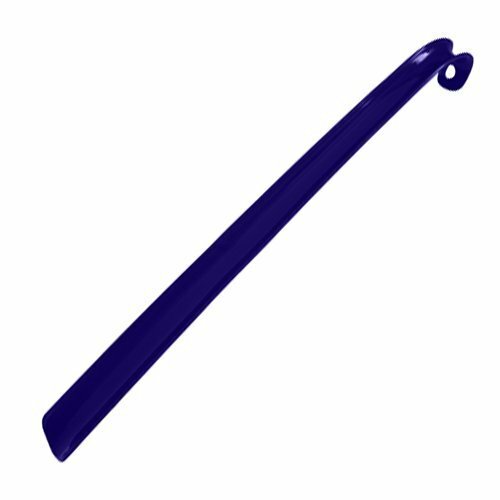 Expertly crafted of flexible yet durable plastic, this shoe horn is made to provide long-lasting strength and use throughout the days, weeks or months of your recovery. This simple yet essential tool measures 18" in length and is outfitted with a hook at one end to position shoes, allowing the user to put on and take off shoes without bending over. Perfect for those who are recovering from hip or knee surgery or permanently disabled due to arthritis, chronic muscle pain and other ailments, this shoe horn will assist the individual when dressing without requiring someone’s help. In addition to reducing the user’s dependence on others, it eases the recovery process by bringing mobility and freedom to those with a limited range of motion. Rehabilitation is an important step in your recovery. Helping you perform a daily task that can be difficult after your procedure, this aid will facilitate your recovery and prevent post-surgery injuries when you return home. To make it complete, the BodyHealt is outfitted with a hole on the end for easy storage and hanging. This allows you to conveniently place on a hook in your home when it’s not being used without the risk of it becoming misplaced. DURABLE CONSTRUCTION. Made of solid plastic to provide long-term strength and use, this shoe horn is built to last. It even features a hanging hole for easy storage when not being used. AIDS IN RECOVERY. Rehabilitation following hip or knee surgery is an important step in your recovery. Helping you perform daily tasks that can be difficult after your procedure, this aid will ease your recovery and prevent post-surgery injuries when you return home. ESSENTIAL TOOL. The BodyHealt plastic shoe horn is a simple yet essential tool for those with limited mobility. At 18 inches in length, this helpful aid allows you to put on and take off your shoes without bending over. VERSATILE USE. This convenient aid is ideal for those who recently had hip, knee or back surgery, or have a limited range of motion due to arthritis, chronic muscle pain and other ailments. It will assist the individual when dressing without requiring someone's help. PROMOTES INDEPENDENCE. Perfect for those who or temporarily or permanently disabled, this shoe horn reduces the user's dependence on others. Furthermore, it eases the recovery process by bringing mobility and freedom to those with a limited range of motion.